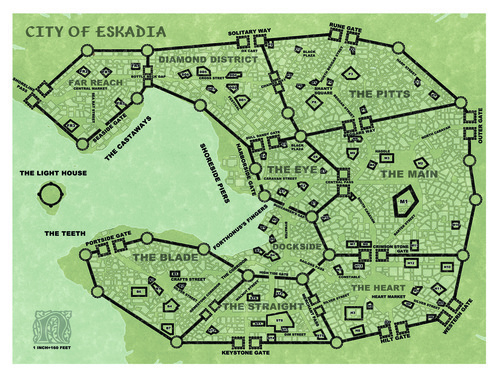 The Free City of Eskadia Map is designed for use with the Free City of Eskadia City Book. The city is set in the Haunted Highlands but is highly portable. Beatutifully rendered by Peter Bradley this 18" x 22" map is printed on poster stock paper. Eskadia, lies far north of the Haunted Highlands upon the Vestlig Sea, where merchants ply their wares and pirates troll for prey. Eskadia, the City Upon the Sea, stands upon the edge of the world. Eskadia is among the most powerful of the western City-States, Trade barons and guild-masters constantly vie for power and control over shipping and rights to raw materials. Sweatshops and workhouses crank out finished goods and crafts to be traded and sold throughout the continent. Every guild-master seeks to be an officially recognized representative to the Western League, and earn the coveted title: Prince of Eskadia. This prosperity does not come without cost. Eskadia is one of the deadliest cities in the world. Eskadia did not get its bloody reputation because of the petty squabbling of its craftsmen and merchants. Eskadia has a long and storied history as a center of underworld activity, cult worship, and black magic. The Knives of Shambere, Cult of Night, The Middlemen, and the Legion of Swords all have strongholds within its high stone walls. While some of these groups, such as the Legion of Swords work above board, the Knives of Shambere and Cult of Night wizard-priests remain in the shadows. Each of these powerful groups feasts upon the constant discord of Eskadia like a parasite. Eskadia is a web of city politics spun by the spiders that run all men's affairs. There are those who think only of the good they are doing, others still who seek money or fame at any price, and still others who are little more than puppets whose strings are pulled by those that dwell in the shadows. Above all are those whose hunger for power knows no bounds. In this dangerous web of deceit and corruption; back alley knife play, espionage, tavern brawls, and street duels are as common as trade and traffic. Free City of Eskadia, Jack of Lies is a complete serial adventure as well. This book comes complete with city maps, area of interest maps and a world map. Adventure awaits!